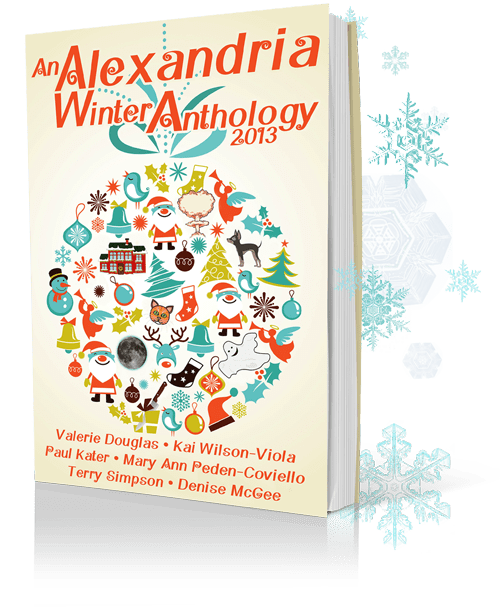 Alexandria Publishing Group 2013 Winter Anthology – Now Available! Several weeks ago, I received an invitation to join the Alexandria Publishing Group – a collective of independent writers who hold themselves to professional standards in craft, editing, and promotion. I am truly honored to be counted among these talented and dedicated authors! Every year the Alexandria Publishing Group produces a winter anthology containing stories from member writers. Unfortunately, I joined too late to submit this time, but I can’t wait to read it! By Denise McGee – Full Moon Christmas – When a reclusive werewolf finds a lost child too close to the full moon, he must fight the change or live with the knowledge that he killed an innocent. By Mary-Ann Peden-Covellio – Cynophobia – One very small dog and two not-so-angelic girls give Santa Claus a Christmas he’d rather forget. By Paul Kater – Our Ghostly Winter – A young boy learns that there is more between earth and heaven, and that it can take the shape of a snowman. By Terry Simpson – The Gifts – 12 Gifts will change a young boy’s life forever. By D Kai Wilson-Viola – Silent Fright – Jess knows that the boys are planning a big surprise and to go along with that, Jess decorates…but the lights attract more than just other survivors and for the first time in months, the walls are overrun with zombies.